Parkinson’s disease (often abbreviated as ‘PD’) is a degenerative disorder of the central nervous system that often impairs the sufferer’s motor skills and speech, as well as other functions. As many as one million Americans suffer from Parkinson’s disease, which is more than the combined number of people diagnosed with multiple sclerosis, muscular dystrophy and Lou Gehrig’s disease. Approximately 60,000 Americans are diagnosed with Parkinson’s disease each year, and this number does not reflect the thousands of cases that go undetected. PD is both chronic and progressive. At present time, there is no cure — but we’re going to the future. We are all affected by this disease, whether personally or through friends, family members, and even those in the public eye. We believe the discovery of a cure will translate to many other diseases as well. A growing number of years ago, a doctor gave Oliver six months to live, with a diagnosis of terminal cancer. This news inspired them to accelerate a ‘bucket list’, and within a very short time they did something crazy and impractical. They hand-built their dream car: a DeLorean Time Machine from the movie Back to the Future. Fortunately, the doctor’s time table was incorrect and they continue to share the joy their car has brought them with the rest of the world, while helping cure a disease along the way. The Hollers joined Team Fox, a branch of the Michael J. Fox Foundation for Parkinson’s Research after hearing that Michael himself has the disease. This organization is a focus due to their admiration for Michael J. Fox, and his inspiration through the Back to the Future trilogy. His optimistic approach in dealing with Parkinson’s is an example that shows everyone can do something to give back. The Hollers continue their adventures with speaking engagements around the world. 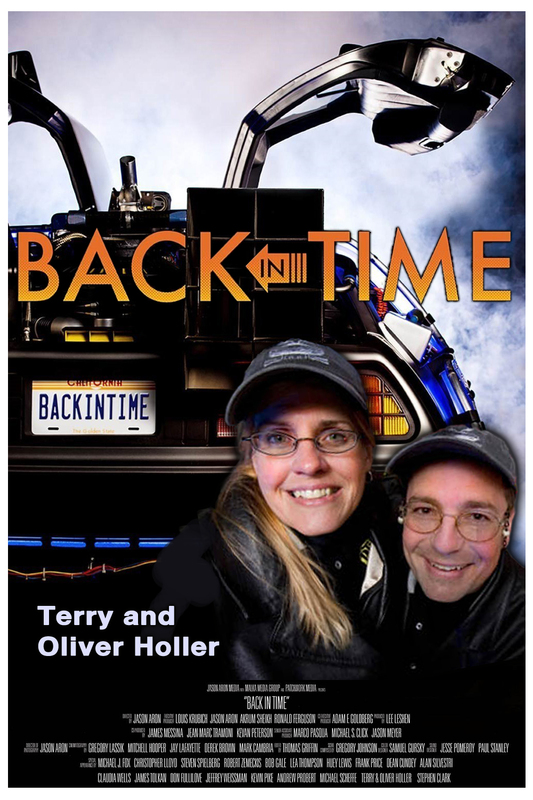 They appear in various books on the Back to the Future subject, are featured in the film Back In Time and have their own publication Time Traveling, which is in the permanent collection of the Library of Congress in Washington, D.C.